Treatment options include bracing, which can be used for both correction and pain management, exercises (SEAS-Scientific Exercises Approach to Scoliosis), or fulcrums. “Hi, I’m Dr. Betty Callen here at the Spine and Scoliosis Clinic, and I wanted to tell you a little bit about all the different scoliosis options we have here at our office. So what we have is a bracing option—not everybody needs a brace but this is called the ScoliBrace (https://www.scolicare.com). 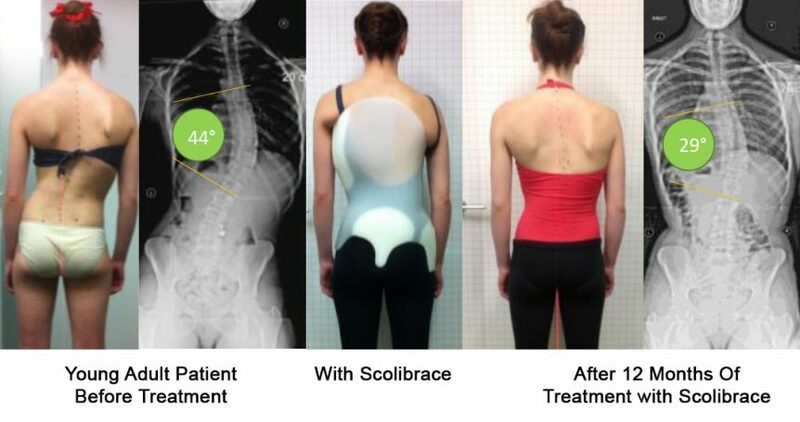 This is the newest technology we have in scoliosis bracing, where the brace actually pushes into the scoliosis to help straighten out the spine. Now this can be used for correction, or it can be used for pain management. So whether you’re a child who is growing with scoliosis who needs to stabilize it, or an adult with scoliosis that wants to manage their pain, this brace is a wonderful tool. And we do have a whole protocol we do follow with the scoliosis brace. Now some people don’t need the brace for scoliosis, so instead we use exercises to help strengthen and stabilize the spine. It’s called SEAS, and it stands for Scientific Exercise Approach to Scoliosis. So we teach all our scoliosis patients how to protect their spine and straighten it out through movement, and then also sometimes we will do hard fulcrums. And so this is called a block for scoliosis. It’s called the ScoliRoll, and sometimes we just have to lay on hard fulcrums to straighten out our spine.